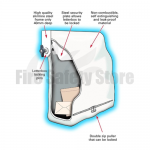 Available from the Fire Safety Store are the anti-arson mailbags which fit on the back of almost any PVC/Wooden door and are an effective way to improve the security of your mail and your premises. 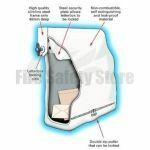 The FireGuard Anti-Arson Fire Protective Mail Bag With Extinguisher Tube will contain, detect and extinguish small fires in less than 15 seconds before it has the chance to spread. 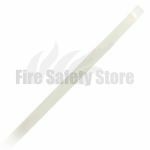 You can also purchase the FireGuard Replacement Extinguisher Tube which is a direct replacement product for the mailguard range of mailbags which can easily be fitted within seconds.